We are thrilled to have won the “Menu Innovation” category at this year’s “Chef Development Awards” for the Henri Le Worm children’s menu at Brasserie Blanc, Henri says “bravo! The Development Chef Awards recognises the unsung heroes of the chef world, whilst celebrating innovative menus across multi-site restaurant and pub groups. 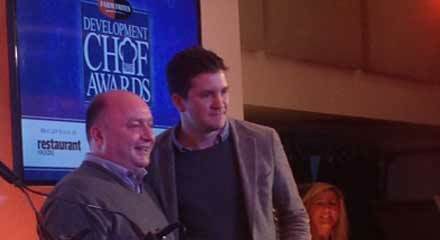 Mark Derry, CEO of Brasserie Blanc says: “We’re delighted with this award. Henri Le Worm is the perfect fun and informative concept for our children’s offering and we feel it’s a reflection of our commitment to honest French cooking”. 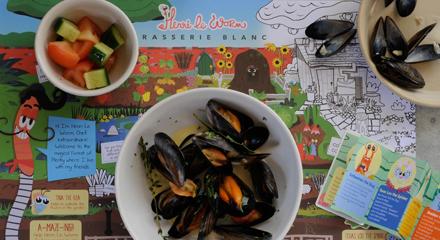 The Henri le Worm menu, available at Brasserie Blanc’s nationwide, costs £5.95 for two courses and includes dishes of mini moules, crispy chicken and mini charcuterie board. 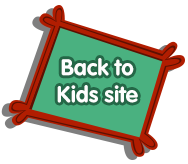 A colourful and fun puzzle sheet keeps kids entertained throughout each meal with recipes and healthy eating tips alongside a Grub Club loyalty card, which offers children a complimentary meal after their seventh visit.